Gerard spent a few autumn days doing construction at his church, sweating in the basement of the building, pounding down water from a package of plastic-bottled water as he went along. After a couple days he felt off. Something was just not quite right. He felt his heart beating far too rapidly. He became irritable. His brain was cloudy, and he felt confused, losing his train of thought. He was anxious. He had dizzy spells and frequently felt like he could pass out. On day three he started feeling a pain in his lower back, in the neighborhood of his liver and kidneys. It was revealed during a discussion with one of The Wellness Way Docs that he had, indeed, been drinking water to re-hydrate himself. Further questioning revealed that the bottles of water he was drinking over those October days had been sitting in his car since April. We’ve had problems with plastic bottles for a long time, but most people are unaware. 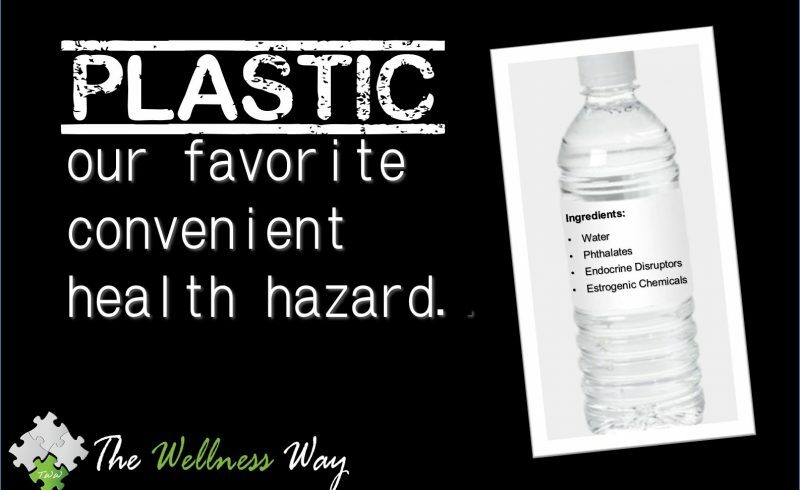 Water in a plastic bottle has to be better for us than soda in… anything, right? It’s water! Let’s forget about the quality of most bottled drinking water for the moment; you’ve probably heard a lot about how not-special the big name bottled water is, and you can count on us writing about it later, so let’s stick with something you may not be aware of. The problem with virtually every plastic bottle on the market is in the creation process. The plastic needs to be heated to be formed, and really needs to cool for up to a year. You see, plastic contains estrogen mimicking chemicals which can leech into the water if they haven’t been properly cooled. A year! Do you imagine for a moment that any company waits that long? Let’s take a closer look at Gerard, who was feeling pretty awful because of the water he drank. The water bottles had been sitting in the back of his car all summer, being heated and cooled with the rising and setting of the sun. When the plastic bottles got warm the material became unstable and released those chemicals into the water. Gerard drank them down with reckless abandon- and why wouldn’t he? BUT BPA FREE IS OKAY, RIGHT? BPAs are a thing of the past, so we don’t need to worry anymore, right? The problem is: dudes shouldn’t be drinking anything that causes EA. For that matter, neither should women. The Wellness Way Doc told him to stop drinking bottled water instantly and to start flushing his system with good, purified H2O. He followed his Doc’s instruction, but it still took almost two months for him to start feeling normal again. This is an extreme case, to be sure, but it points to a problem that isn’t- most people feel crummy and just tolerate it. Until you have a reaction like this, and make that journey to feeling better, you don’t realize how bad you feel. Stop drinking from plastic cups and bottles. It’s easier than you might think. You can easily find glass bottles that are reusable. That recycling act will probably save you money on the back end as well. Another option is stainless steel bottles or vacuum cups. BUT keep in mind that many of those bottles have plastic pieces. Is that a reason not to use them? Nope- I say with one important caveat: when you wash those pieces you have to let them dry completely, or mold and fungus may develop. And that goes for any dish or part of a dish made with plastic. Carbonless receipts, which everybody and their grocery store seems to use now can be a source of exposure. Obviously, you can’t avoid them but you can limit your contact with them. Use glass containers as opposed to Tupperware and similar material. Avoid cooking in plastic containers or using the plastic roasting/steaming bags. Let me ask you a few questions: do you sometimes find yourself feeling crummy? Do you ever feel logy and tired? Do you get headaches for no apparent reason? Any dizzy spells? I’m not going to say that if you do it’s because you’re drinking toxins in plastic bottled water- that’s not what The Wellness Way does (we don’t guess; we test). There are so many ways that we absorb toxins that we don’t always, or ever, consider. We just thought it was worth telling you Gerard’s story if, for no other reason, you can be aware of the pitfalls of plastic bottles.